So, I’ve finally finished this mammoth of a book. It’s a fairly comprehensive, though not exhaustive, look at how protology and eschatology connect to produce a vast wealth of biblical theology. It’s strength is the amount and depth of stuff you get on various topics, providing a reader a good framework to think further about the content of one’s biblical theology. However, it’s weaknesses are that it’s so damn big for something aimed at an educated lay reader, and the lack of particular topics. My gripe on that front is the lack of anything that talks about the physical dimension of new creation and the renovation-restart debate. Given the amount of times Beale talks about new creation, you’d think that he’d actually talk about it more. Minor quirks – at some points, you’ll pick out the fact that Beale is coming from a Reformed background. This doesn’t happen too often, but there were points when I thought “Why is this section here?” only to realise that, for example, the covenant at creation thing is clearly a thing the Reformed guys are hung up on. I also thought that Beale’s chapter that is somewhat related to ethics could do with a conversation with Brian Rosner, vis a vis The Law. In other words, if you read Andrew Cameron’s book, you’ll get a much better grip on how you deal with the OT Law and how to carry it on into the now-not-yet context. The main reason I’d suggest that someone get this book would be to fill out someone’s biblical theology, and provide something that doesn’t explicitly come from Goldsworthy. 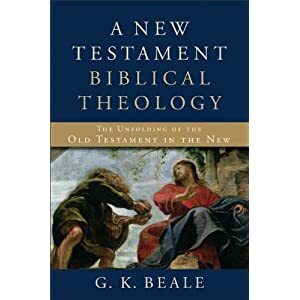 What this book will show a young punk interested in theology, if they can persevere through the reading (probably get them in chapters at a time), is _how_ the themes of the OT actually organically connect in the NT and create a consistent theology. Whereas According to Plan is largely a canonical survey, this is a thematic survey, and the two will largely complement each other. What we really need, though, is a more concise version of this type of work. This entry was posted on Monday, July 9th, 2012 at 6:10 pm	and is filed under Reviews. You can follow any responses to this entry through the RSS 2.0 feed. Both comments and pings are currently closed.